Apex Window Films strives to offer the most comprehensive selection of DIY and wholesale decorative and privacy films for our online customers across North America. We have specially chosen films suitable for a wide range of applications, decors, and DIY projects. 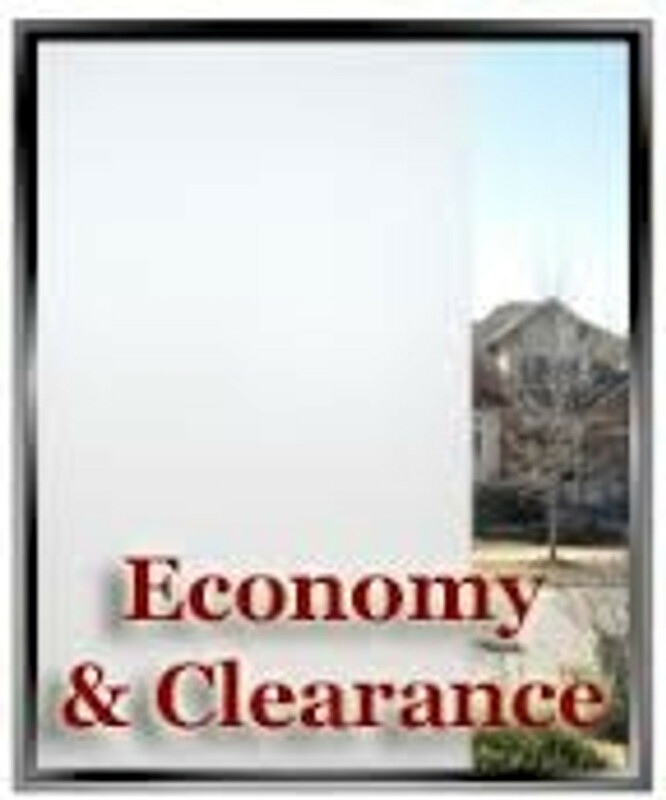 The Economy and Clearance films in this category are meant to meet the needs of those where economy is the primary concern. Low-priced "Light Duty" films as their name implies are very affordable, though not the same quality level as our premium lines. You can buy premium films at a great price, however, by purchasing roll ends and clearance products (indicated in the title or description) in this category. Please scroll down to view our most economically priced decorative window films and clearance items. If you are looking for promotional pricing on other film categories, please click here for a complete listing. Available Width 35.25" Matte frost window film with birds in flight and at rest with flowers; from the Apex Fun Films line of light duty decorative window films. Available Width 35.25" Unique, abstract pattern window privacy film from the Apex Fun Films line of light duty decorative window films. Available Width 35.25" Delicate floral pattern from the Apex Fun Films line of light duty decorative window films. A pretty alternative to classic frost. Available Width 35.25" Embossed floral pattern from the Apex Fun Films line of light duty decorative window films. A pretty alternative to classic frost. Available Width 35.25" Embossed pattern of uniform shell shapes from the Apex Fun Films line of light duty decorative window films. A pretty alternative to classic frost. Available Width 35.25" Fun flower pattern window film, the hallmark of our fun films line of light duty decorative window films. A pretty alternative to classic frosts. Available Width 35.25" Interesting geometric star pattern window film with excellent privacy rating from the Apex Fun Films line of light duty decorative window films. Available Width 35.25" Grape Vine pattern window privacy film from the Apex Fun Films line of light duty decorative window films. A pretty alternative to simple frost for privacy. Available Width 35.25" Icebergs, abstract pattern window privacy film from the Apex Fun Films line of light duty decorative window films. An interesting alternative to simple frost for privacy. Available Width 35.25" Assorted size falling leaves and flowers pattern from the Apex Fun Films line of light duty decorative window films. A value priced alternative to our ever-popular Autumn Leaves pattern. Available Width 35.25" Lotus flower pattern from the Apex Fun Films line of light duty decorative window films. Available Width 17.75" Pretty fan pattern appears to be painted to your pane from the Apex Fun Films line of light duty decorative window films.